In the Helen and Felix Juda Gallery, a presentation of swords, sword fittings, and other weaponry from local collections will be on display. From the LACMA collection, an array of color woodblock prints depicting warriors in battle will be on view as well as a selection of garments worn by samurai and their wives. Battle screens and paintings made for the samurai will also be on view. 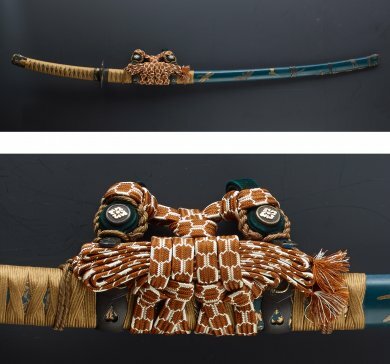 “Art of the Samurai” is co-curated by Robert T. Singer, curator and department head of Japanese art, LACMA; samurai art specialists Mike Yamasaki, Darin S. Furukawa, and Gary Yoshino; and Sharon S. Takeda, senior curator and department head of costume and textiles, LACMA. “Art of the Samurai” highlights include “Battle of Ichinotani and Battles of Dan-no-ura and Yashima”, a 17th-century six-panel screen depicting historic battles through an array of warriors, samurai, garb, and weaponry; as well as “Snow, Moon, Flower Calligraphy,” a set of three hanging scrolls made by a leading member of the ruling Tokugawa Shogun family, one of the finest examples of masculine samurai calligraphy. Japan ended its policy of mandatory military service in 792 and provincial landowners had to rely on their own private forces for defense, giving rise to the samurai class. For nearly 700 years, beginning in 1185, Japan was governed by a military government, led by the shogun, ruling in the name of the emperor. Samurai warriors were loyal to individual daimyō — provincial lords with large hereditary land holdings. In 1600, after periods of clashes between rival clans, the Battle of Sekigahara paved the way for Tokugawa Ieyasu to unify Japan and establish a new shogunate. Fifteen shogun from the Tokugawa family ruled over a period of peace lasting some 250 years. During the subsequent Meiji Restoration in 1868, the emperor reasserted his authority as supreme ruler, and the samurai as an official elite class was dissolved. The term “samurai” comes from the verb saburafu, which means “to serve by one’s side.” Initially, samurai were armed servants; later, they became experts in warfare. Samurai armor consists of a helmet (kabuto), mask (menpō), and chest armor (dō) combined with shoulder guards, sleeves, a skirt, thigh protection, and shin guards. Additional articles, including a sleeveless surcoat (jinbaori), complete the set, which might weigh between 20 and 45 pounds in total. Many materials were required to produce a suit of Japanese armor that was as beautiful as it was functional. Iron, leather, brocade, and precious and semiprecious metals were often used. Several artisans worked for many months to create a single samurai suit of armor. LACMA is located at 5905 Wilshire Blvd. in Los Angeles. For more info, visit the website.